Convert waste plastic and tire into hydrocarbon oil & gas to be used as fuel. Pyrolysis plant is industry that converts waste plastic & tyres into pyrolysis oil, carbon black & hydrocarbon gas. More than 90% of machinery parts are non-moving: this reduces the recurring maintenance. 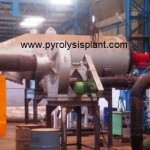 pyrolysis plants on turnkey basis in India. Navi Mumbai, Maharashtra State, India. PIN: 400 614.